Make easy to fill pdf form with the help of PDF Form Filler Software. Stealth Storage is a small and powerful file encryption tool. Excel Password Recovery lets you recover any Excel password in a flash. Import Excel spreadsheet into MicroStation and keep them updated. Become prepared for the best utility download experience you have ever had! Discover the many software program groups, check the latest releases of the general tools, and trial software for free. Take free access to all sorts of laptop applications: enterprise solutions and utilities, games, backup software solutions, and many others. The Softempire special software utility catalog increases always! Each new day carries special innovated software here, the greatest software solutions. Try for free and get a benefit! Top utility package 2011 downloads for free! System software projected to help explore, configure, optimize, and maintain the computer. Top Disk utility software downloads for Windows 7. Windows utility software tool collection to value, organize, and improve the activities of the computer. BookPrintMe is a shareware programm for MS-Windows 9x. This program prints booklets or books and saves paper by printing up to 16 pages on both sides of a sheet. A series of booklets are combined to build a book. BookPrintMe operates as a printer driver that may be used by any application. Several print jobs may be accumulated for printing of booklets. E.g. you may print a booklet that contains several topics of a help file. This is done by executing the print funktion of the help system for each topic. In general BookPrintMe is suitable to print program manuals (readme.txt), help files, cook books, address books, program source listings, elektronic publications etc. 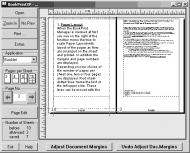 BookPrint uses the EMF-file format for spooling the print jobs and requires the support of this format by the application, which is the case for most applications, e.g. Acobat Reader Version 4.0 is supported by BookPrintMe. Some applications do not support the EMF-format and thus do not support BookPrintMe. Home Inventory Book: Tool for organizing, planning, and keeping track of your home or office contents. You may gather as much detail as you: item name, producers, location, warranty time, value, service phone, notes and much more. Memory Optimizer is an easy to use yet powerful program that Boosts your PC's Performance and Stability up to 200%.